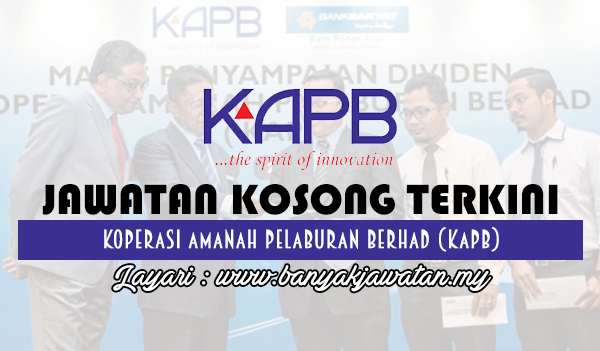 Koperasi Amanah Pelaburan Berhad, was established to pioneer the new “corporate identity” for cooperative in Malaysia. YBhg. Dato’ Ilyas Mohamed,is the Executive Chairman of the Board of Directors. We are an active investor in sectors with long-term value propositions, to create opportunity and encourage the low and middle income earner among Bumiputera’s to involve in corporate business and investments that generates high return. KAPB aims to contribute in the national economic transformation and the growth of the middle and upper income population among Bumiputera’s. 0 Response to "Jawatan Kosong di Koperasi Amanah Pelaburan Berhad - 27 Jun 2018"